This is from the Asprox botnet. Asprox shifted to spamming with malware attachments about halfway thru December. the consistency in Envelope headers, From headers, and HELO, as apposed to the aexp-nacha-whatever from Cutwails. The kuluoz/dofoiol trojans. The Message-ID header has the netbios name of the infected windows computer, giving that touch of personal interest. The http get /hexadecimal hash and POST encrypted key.bin and data.bin. Occasionally you find commonality in Asprox's language: the "you should download it", matter-of-fact style was in several Asprox fake airline emails that came out like 6 months apart. Here are the relative distributions of each, where the first number is the number of spam samples collected in the Malcovery Security Spam Data Mine. 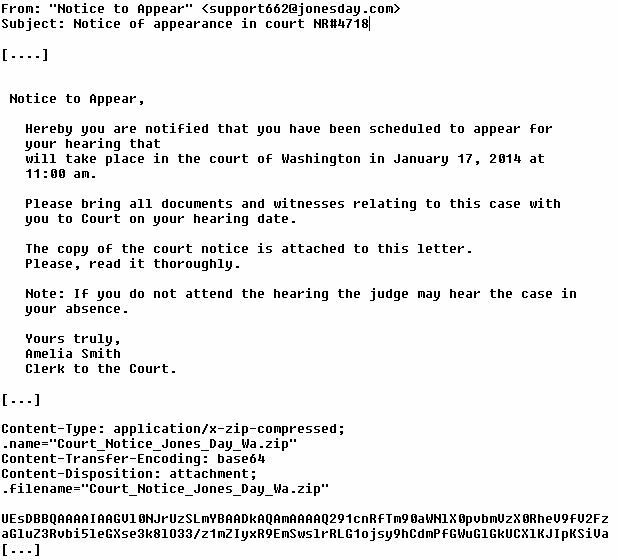 The second column is the domain name used, the third is the MD5 of the .zip attachment, and lastly, in 15 minute increments, the first and last time period in which spam bearing this attachment was seen. A new version of the JonesDay spam has begun this morning (Dec 27 @ 6:15 AM US Central time, GMT -6).